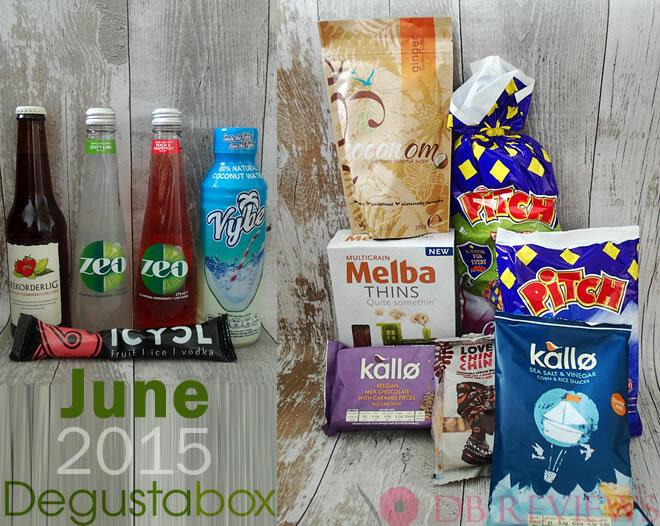 The June Degustabox had a picnic theme and included lots of yummy treats! If you are new to my blog or are unaware of Degustabox, then here is a quick introduction to the box. Degustabox is a food subscription box that is delivered every month packed with surprise goodies. The box costs £12.99/month including the delivery charges and there is no commitment on the length of your subscription. Each month around 9 to 14 surprise products are included in the box, some of which are new to the market! Let's begin with the drinks. There were two bottles of Zeo. Zeo is a regular fixture at our home. This lightly carbonated soft drink is a blend of 98% spring water with naturally extracted fruits and botanicals. I like its crisp, clean flavour and Zesty Lime remains my favourite ever since I tried them for the first time in 2013. The Rekorderlig Strawberry Lime Cider would make a perfect choice for a Summer picnic. It combines the sweetness of Strawberry with the citrusy zing of lime. With a lovely, fresh flavour this makes for a refreshing drink for the hot afternoons. An unique and interesting product in the June box was the frozen vodka icepop - Icycl. With a 6.4% kick of vodka this frozen vodka icepop is prefect to take your party anywhere as the makers say. They have hit the bullseye with this product. I loved it. I will be trying the other flavours. Vybe Coconut Water - I love coconut water. During summer time, green coconut vendors are found in most markets in India. It was my go-to drink while I was in college - not the bottled variety but the tender fresh ones which contain a significant amount of electrolytes. I was excited to see Vybe in the June Degustabox but sadly the taste was not what I had expected. I am not sure if there was something wrong with the batch I received but the drink tasted very artificial - almost plastic; like the bottle it was packaged in. Let's now move on to the snacks in the June box. The Melba Thins are perfect for snacking. You can have them as is or use yummy toppings. You can see one of my earlier Degustabox posts for some topping ideas. The Kallo Sea Salt and Vinegar snack was a hit at home and so was Love Chin Chin. It tasted yummy and reminded me of an Indian snack called Shakarpara. The Brioche Pasquier products disappeared at a very quick pace. Mr.H likes these! The second product from Kallo - the chocolate rice cakes did not strike the right chord like the corn and rice snack. While I haven't baked with the Coconom Organic Coconut Sugar, I am using it as an alternative to sugar in my daily afternoon tea and am starting to like it. So, that was the June Degustabox. Which is your favourite product from the selection? Does the concept of a surprise food box excite you? If you fancy trying a box for yourself, you can use this code O5DW6 to get a £3.00 discount of your first order.